Just heat it in the microwave for 2 minutes. The Large NeckEase can be used tight around the neck or draped over the shoulders and upper back providing warmth and gentle pressure while encouraging shoulders to drop and relax. Alternatively, store it in the freezer to use as a cold pack when you need to address acute injury or after intensive exercise or physical therapy. 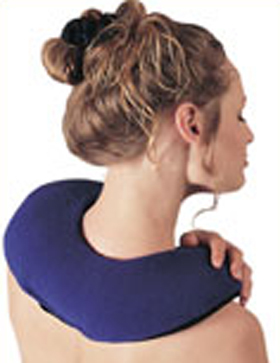 All Neck Ease Comforts have soft fleece on one side allowing for moist heat and aromatherapy penetration. The other side is made of a durable material that maximizes heat retention, and is the side to use on your shoulders for cold therapy.